This chapter focuses on Thailand's foreign labor migration, which has played a critical role in the economic development of Thailand. Emphasizing both positive and negative effects of foreign migration to the Thai labor market, Thailand economy, and sustainability in economic development, this chapter separates foreign migrant workers into two types, legal and illegal, and analyzes the impact of each type of migrant worker on wages, labor market, Thai economy, innovation, and sustainability. While foreign skilled laborers, who usually receive formal work permits from the Thai government, as well as capital and native workers are complements, the unskilled or low-skilled workers, usually from neighbor countries, as well as capital and native workers, are substitutes. 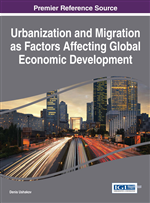 Furthermore, the impact of each group of foreign migrants on economic development and government reactions (as reflected in migration policies) is also elaborated before discussion for migration and development in the long term. Thailand has long history of foreign labor migration. Starting from Ayutthaya period, 16th century, the Portuguese were one of the first coming to Thailand. Other migrants in that period were from China, Holland, France and Japan. In the early Rattanakosin period (1782 – present) big number of Chinese was granted to settle and work in Siam (former name of Thailand). Those Chinese significantly raised number of population to around 45,000 people. Until 1898, total number of Chinese in Siam was approximately 600,000 (Pitayanon, 2001). Meanwhile, migrants in the early Rattanakosin era included Indians, Malays, and European merchants. The European traders settled in Thailand for trading with local people as well as for expanding commercial network worldwide (Paitoonpong, 2012). Foreign labor demand in the new era of Thailand started to increase in 1960s, when policy for economic development acceleration was implemented. In the first stage of industrial development, Thailand highly demanded in foreign labor, both high-skilled and lower-skilled. According to the Alien Working Act B.E. 2551 (2008 A.D.), “alien” or “foreigner” means non-Thai nationality natural person and “working” means a working by physical strength or knowledge whether or not intended for wage or any other benefits.